As part of the first ever Colombo Development Dialogue held in April 2018, a masterclass with Dr Rajesh Venugopal was organised by South Asia Centre, LSE in collaboration with UNDP in Sri Lanka. Amayaa Wijesinghe, of the University of Colombo, reports her experience. It isn’t often that you are transported to the lecture halls of one of the world’s premier universities, hearing an eminent academic expound on the current developmental issues in South Asia. For a postgraduate student based in Colombo, Sri Lanka, this was fulfilled through the ‘Colombo Development Dialogues (CDD) Masterclass’ organised by the South Asia Centre, the London School of Economics and Political Science (SAC, LSE) and United Nations Development Programme, (UNDP) Sri Lanka. 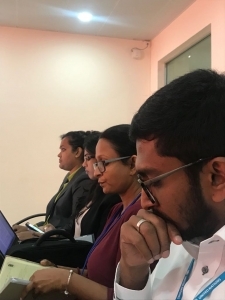 A first of its kind, the Masterclass brought together postgraduate research students from various fields and universities across Sri Lanka, and it was heartening to see the effort taken to ensure that students from a cross section of specialisations were represented at the CDD Masterclass. As a student of environment sciences and conservation, my academic dealings with the study of poverty in Sri Lanka have been indirect. I was never compelled to explore indices and other statistics surrounding poverty; instead I have studied the increased vulnerabilities of rural communities through ecosystem degradation and loss of ecosystem services. I had not approached the topic by reading and analysing reports published by the Central Bank as my experience lay in understanding the lived realities at a community level. Dr Rajesh Venugopal conducting the Masterclass in Colombo in April 2018. 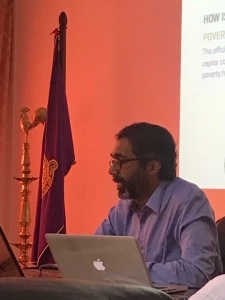 As Dr Rajesh Venugopal, lecturer in International Development and Managing Humanitarianism at LSE, began his discourse on “Poverty, Social Welfare and Data in Sri Lanka”, I found myself completely absorbed by the numbers behind the dynamics of poverty alleviation in Sri Lanka. Our prescribed reading for the class was “Sri Lanka Poverty and Welfare: Recent Progress and Remaining Challenges”, a report published by the World Bank in 2016. Dr Venugopal delved deep into some overarching patterns that were highlighted in the report. The good news was Sri Lanka’s poverty reduction rate was commendable in the period examined by the report, as the poverty rate fell from 22.7 per cent in 2002 to 6.1 per cent in 2012-13 (this excludes data from the Northern and Eastern Provinces, which were inaccessible during this era due to the civil conflict). The fruits of this drop can be spotted easily in Sri Lankan society today. The severe rush hour traffic jams indicate a higher per capita income, enabling purchase of more durable goods such as vehicles. A chat with a friendly tuk-tuk driver will lead you to the discovery that his daughter has just entered the Medical Faculty, a result of higher school attendance and access to good education. The bad news was the inequality in how these fruits are enjoyed by the population. If the value of the poverty line used to obtain the poverty headcount rate is merely doubled, making it $2.75 (Rs 225) per capita per day in 2005 PPP (Purchasing Power Parity) terms, you suddenly find that 40 per cent of the population subsist on this amount or less. This component, consisting of the poor and near-poor, have little access to public facilities and basic services, and the report states that their living standards have improved little since 2002. The stark inequalities in poverty alleviation are clear. If our vision for Sri Lanka is inclusive growth and sustainable development by 2030, then there is a problem, because 40 per cent of the population is being left behind. The lecture was engaging, illuminating and thought-provoking. Dr Venugopal’s deep knowledge of the ebb and flow of Sri Lanka’s development narrative was clear, and the questions he posed to us researchers at the end of the lecture were rooted in his unique insights. We were not allowed to take the findings of the report at face value. We were asked to question the data, the methods and the conclusions, and were encouraged to engage in a lively dialogue about what we had assimilated. The value of bringing together students from multiple disciplines was apparent during this session. Questions, comments and insights flew back and forth across the table, and within the course of an hour we had successfully hazarded answers to questions that had baffled the World Bank, unlearned biases that may have come through privileged backgrounds, and critically examined the solid takeaways and questionable recommendations made by the report. On a personal note, the most significant outcome for me was the crystallisation of some particles of thought that had been bouncing around in my head for some time, pertaining to the approach we use for development. GDP per capita and the economic growth that it signifies is an outdated and dangerous standard by which to measure sustainable development. This in itself is not a new school of thinking. I attribute the shift in perspective, which occurred during the Masterclass, to the inverted model of development that was described by Dr Venugopal, who said that the highest aim of development should be to equip a human being to reach his full potential, and should not be limited to filling his purse and calling it a day. Money is simply the means to an end, and must not be confused with the end goal. As the economist, philosopher and Nobel Laureate Amartya Sen put it, “poverty is not the lack of money; it is not having the capability to reach one’s full potential as a human being”. Perhaps this is the difference between a class and a masterclass. The blurred lines become sharper and you leave with deeper understanding, and a renewed sense of purpose. Sri Lanka has come a long way in terms of poverty alleviation, and I believe that the insights shared and connections made during the CDD Masterclass was a valuable refuelling point in my journey towards contributing effectively to an inclusive, just and sustainable Sri Lanka. Watch the video of the Colombo Development Dialogues here. Amayaa Wijesinghe is a graduate of the Department of Zoology and Environment Sciences, University of Colombo, Sri Lanka. Her research interests lie in ecosystems and biodiversity conservation, and the adaptive capacity provided for rural communities through these initiatives.